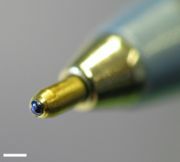 The tip of a common disposable ballpoint pen. The ball, with blue ink on it, can be seen. The white scalebar is 1mm wide. The manufacture of economical, reliable ballpoint pens resulted from a combination of experimentation, modern chemistry and the precision manufacturing capabilities of 20th century technology. Many patents worldwide are testaments to failed attempts to make these pens commercially viable and widely available. It has even been argued that a design by Galileo Galilei (during the 17th century), was that of a ballpoint pen. The first patent on a ballpoint pen was issued on 30 October, 1888, to John J Loud. The pen had a rotating small steel ball, held in place by a socket. The pen proved to be too coarse for letter writing, but it could be used to mark rough surfaces, especially leather, but it was not commercially exploited. Slavoljub Eduard Penkala had invented a solid-ink fountain pen in 1907, a German inventor called Baum took out a patent in 1910, and yet another ballpoint pen device was patented by Van Vechten Riesburg in 1916. The ink was placed in a thin tube, whose end was blocked by a tiny ball, held so that it could not slip into the tube or fall out of the pen. The ink clung to the ball, which spun as the pen was drawn across the paper. These proto-ballpoints did not deliver the ink evenly. If the ball socket was too tight, the ink did not reach the paper. If it was too loose, ink flowed past the tip, leaking or making smears. Many inventors applied their minds and skills to remedying these faults, but without commercial success. Ladislas was frustrated by the amount of time that he wasted in filling up fountain pens and cleaning up smudged pages, and the sharp tip of his fountain pen often tore his pages. Biro had noticed that the type of ink used in newspaper printing dried quickly, leaving the paper dry and smudge free. He decided to create a pen using the same type of ink. Since, when tried, this viscous ink would not flow into a regular fountain pen with the help of his brother George, a chemist began to work on designing new types of pens. He fitted this pen with a tiny ball in its tip that was free to turn in a socket. As the pen moved along the paper, the ball rotated, picking up ink from the ink cartridge and leaving it on the paper. He filed a British patent on 15 June, 1938. In 1940 the Biro brothers and a friend, Juan Jorge Meyne, moved to Argentina fleeing nazi Germany and on June 10, filed another patent, and formed Biro Pens of Argentina. The pen was sold in Argentina under the Birome brand (acronym of Biro and Meyne), which is how ballpoint pens are still known in that country. Laszlo was known in Argentina as Ladislao. This new design was licensed by the British, who produced ball point pens for RAF aircrew, who found they worked much better than fountain pens at high altitude. Eversharp, a maker of mechanical pencils teamed up with Eberhard-Faber in May 1945 to license the design for sales in the United States. At about the same time a U.S. businessman saw a Biro pen in a store in Buenos Aires. He purchased several samples and returned to the U.S. to found the Reynolds International Pen Company, producing the Biro design without license as the Reynolds Rocket. He managed to beat Eversharp to market in late 1945; the first ballpoint pens went on sale at Gimbel's department store in New York City on October 29, 1945 for US$12.50 each (about USD$130 of today's money). This pen was widely known as the rocket in the U.S. into the late 1950s. Since 1990, Biro's birthday (the 29th of September) is Inventor's Day in Argentina. There are two basic types of ball point pen: disposable and refillable. Disposable pens are chiefly made of plastic throughout and discarded when the ink is consumed; refillable pens are metal or plastic and tend to be higher in quality and price. The refill tends to replace the entire internal ink reservoir and ball point unit rather than actually refilling it with ink. The simplest types of ball point pens have a cap to cover the tip when the pen is not in use, while others have a mechanism for retracting the tip. This is usually controlled by a button at the top and powered by a spring within the pen apparatus, but other possibilities include a pair of buttons, a screw, or a slide. Ballpoint pens are ubiquitous in modern culture. While other forms of pen are available, ballpoint pens are certainly the most common and almost every household is likely to have several. The fact that they are so cheaply available (costing from just a few cents/pence to produce) and so convenient to use means they are often to be found on desks and also in pockets, handbags, purses, bags and in carsâ€”almost anywhere where one could conceivably need to use a pen. Ballpoint pens are often provided free by businesses as a form of advertising printed with a company's name, a ballpoint pen is a relatively low cost advertisement that is highly effective (customers will use, and therefore see, a pen on a daily basis). Businesses and charities may also include ballpoint pens in direct mail mailings in order to increase a customer's interest in the mailing. Cannot write on plastics and shiny surfaces. Cannot write on wet or oily surfaces. Scribble circles on cardboard found covering notepads. Normal 80gsm paper doesn't seem to restore ink flow as quickly.